I said farewell to November with a near-perfect Greencastle day. Before breakfast I faced a task I should have faced weeks ago: reading through a bunch of essays by the philosopher Cheshire Calhoun to choose which three I want to feature in the Cheshire Calhoun reading group I'm organizing at the Prindle next semester. Why on earth I put this off, I have no idea. The entire task involved reading and rereading exquisite essays by my favorite living philosopher: "Changing One's Heart" (on forgiveness), "Standing for Something" (on integrity), "The Virtue of Civility,""What Good Is Commitment?" and "Common Decency." What task could be more pleasant? But for some reason it stressed me to face it - how could I pick only three of the essays? Which three? But today I did it and chose the ones on forgiveness, civility, and commitment. Done! I gave three talks to the three second grade classes at Ridpath Elementary just blocks from my house. I discovered last month that my Gus and Grandpa and the Two-Wheeled Bike is a selection in the Harcourt Story Town reader used in the Greencastle schools. I had known I was in some Harcourt textbook because a Harcourt photographer came to my house in Boulder years ago and spent hours on a very hot summer day photographing me standing next to a bicycle in my garage. But I had never actually seen the final product. It was so much fun to come to Ridpath as a Gus and Grandpa celebrity. I spent a mellow afternoon at the Prindle Institute puttering at my desk and going to a delightful staff meeting. How many people have jobs where the staff meetings are a treat? I do! Finally, I attended a gorgeous chamber music concert - Beethoven, Handel, Mozart, Mendelssohn - that featured one of my wonderful Rousseau class students on violin. It would be hard to find a more satisfying way of bidding adieu to November. One of the five reading groups I'm in this semester at the Prindle Institute is a reading group on the late-life writings of French philosopher Jacques Derrida. It concluded with a festive fifth meeting yesterday evening. My philosophical education in a department devoted to what is called "analytic" philosophy taught me to despise what is called "continental philosophy" - indeed, to despise it without ever having deigned to read it. Without ever reading it, I knew it to be unreadable. Jacques Derrida is a leading figure of contemporary continental philosophy. He is widely read by scholars in English departments - not by scholars in Anglo-American philosophy departments. But when I was asked by a DePauw colleague in the English department here to join the Derrida reading group he was organizing, I happily agreed. After all, I'm committed to saying yes to everything I'm asked to do at DePauw so that they will all love me and think I'm the best visiting professor ever. And I did think it was strange for an entire CONTINENT of philosophy to be dismissed so contemptuously. That said, I'm glad I was part of the reading group. While I didn't much like trying to read Derrida, I liked hearing smart people say interesting things about it. I must confess that last night I hadn't actually gotten around to doing the reading for the evening. It would have taken me hours to force myself through it, hours that I decided would be better spent on other tasks on my to-do list. I almost didn't go because I didn't want to be "the bad student" who comes to class unprepared. But I did go, out of loyalty to the group, and I learned a lot from the conversation (and even got quite a bit of the reading done as we all stared down at these daunting pages together). I even managed to make one semi-interesting comment about Derrida myself! So I guess the lessons I would distill for myself from this experience have to do with being willing to try something new, even if I don't decide to throw myself into it wholeheartedly. I would probably have gotten more out of the Derrida group if I had labored mightily on those dense and impenetrable chapters. But that "more" wouldn't have been worth the many many hours necessary to do it. I invested a little bit of time in the Derrida project and reaped a little bit of benefit, including getting to know some extremely bright colleagues in other departments around campus. That feels like a decent enough return for several evenings sitting by the Prindle Institute fireplace sipping good wine and eating lovely fruit and cheese. Every month I get sent five books to review for the online review site Children's Literature. The box arrives, I open it, I read whatever is in it, and then I write 150-250 words about each title. The most fun, of course, is opening the box. I hope it won't contain the second very long volume of some young adult fantasy trilogy; I hope it will contain fresh, funny chapter books. But I don't like to make too many specific requests of the team who send the books out to the reviewers. For one, it would make a difficult job even more difficult for them. But mainly it just seems unsporting. This month the box had in it four picture books as well as the fiftieth anniversary edition of The Phantom Tollbooth by Norton Juster. I haven't read The Phantom Tollbooth since Mrs. Orenstein read it aloud to us in fifth grade. Back then I hadn't liked it all that much. Certainly not as much I had loved Johnny Tremain, which Mrs. Robertson read aloud to us in fourth grade, and which remains one of my all-time favorite books. Norton Juster's humor was so self-conscious; you could tell how funny he thought he was being. All right, it WAS sort of like Louis Carroll's humor, but I had never been a huge Alice fan, either, not the way I was a fan of Anne of Green Gables and A Little Princess. But reading it this past week to submit my review, I found that the book started to grow on me. As I read the wonderful tributes to it included in this anniversary edition - by luminaries such as Maurice Sendak, Jeanne Birdsall, and Maria Nikolajeva - I began to feel ashamed that I hadn't loved it the first time around. The story of a world in which rhyme and reason have been banished does feel awfully timely, I must say. My favorite bit on this reading, the one that most spoke to me, is Milo's encounter with "the Terrible Trivium," who occupies all his own time - and everybody else's as well - with endless pointless tasks. "What could be more important than doing unimportant things?" he asks. "If you stop to do enough of them, you'll never get to where you're going." He continues, "If you only do the easy and useless jobs, you'll never have to worry about the important ones which are so difficult. You just won't have the time. For there's always something to do to keep you from what you really should be doing." I confess that my life lately has been ruled by the Terrible Trivium. When I try to think of what I've been doing for the last few months instead of writing, it's hard for me to come up with an answer. I do know that every single day has been very very busy, filled to bursting with - well, with whatever it is I've been doing instead of what I really should be doing. Thank you, Norton Juster, for pointing this out! And congratulations on the fiftieth anniversary of this now-classic book. 1. I'm grateful for the fact that when I woke up this morning the house already smelled like Thanksgiving, from the lingering aroma of the pumpkin pie that I baked yesterday. 2. I'm grateful that I baked the pie from the same recipe on the Libby canned pumpkin label that my mother used every year, leaving out the cloves the same way that she left out the cloves because our family doesn't like our pumpkin pie too spicy. 3. I'm grateful that Christopher put the pie in the oven for me because I had terrible sloshy visions of its ending up all over the floor, and his steady hands took care of it for me. 4. I'm grateful that Gregory came over from his apartment as the pie was baking and right away saw that the smoke detector in the hall was hanging open, missing its battery, and in five minutes he had a new battery installed. 5. I'm grateful that the crimped pie crust, which turned alarmingly brown after the first fifteen minutes of baking at 425 degrees, did NOT get any browner during the remainder of the baking time because of the protective strips of tin foil that Christopher helped me place around it. So that is my list on this Thanksgiving morning. A lot of you know that I have a strange family. We've been badly broken because some of our members have been badly broken. I've been badly broken myself. I love the line Chris Cleave gives his heroine in his novel Incendiary: "I am a woman built on the wreckage of myself." I think I have a family built on the wreckage of itself. But despite that, we're still a family. Maybe even, because of that, especially a family. This is the week for Americans to come together to be thankful. I'll teach my Rousseau class on Tuesday morning, give three talks at a Greencastle primary school on Tuesday afternoon, have dinner with my friend Deepa on Tuesday evening, and then fly home very early Wednesday morning. I've emailed Christopher the grocery shopping list so that I can leap into feast-preparation as soon as I hit Boulder. Right now I'm sitting at the computer at my beautiful, peaceful office out at the Prindle Institute, looking out my window at a light November rain. Everything is so green here even as winter is approaching. I have been invited to stay on for a second year at the Prindle, and I've accepted. This will NOT turn into a permanent appointment at DePauw: the Prindle has visiting lines only, and the Philosophy Department is already well stocked with brilliant people in my sub-area. But I'm so glad at the thought of another year here. I'm going to get to teach children's literature in the English department in the fall! This is a lifelong dream of mine that will now come true. And I'm going to be organizing a major conference on Ethics and Children's Literature, also for fall 2012, which I can start planning now. I can continue building relationships with Greencastle public schools. I can find more covered bridges: indeed, yesterday, out for a Sunday drive around Putnam County country roads with a friend, I came upon the Cornstalk Bridge, one more for my list. So this is a lot to be grateful for as I head home for Thanksgiving. I have decided that I have a strange problem in my life right now: I am having too much fun. This is not a problem I expected to have during my year at DePauw. I expected that I would be having long days to do nothing but read, write, think, and grow as a children's book author and philosopher. What could there be to do at this small liberal arts college, where I'm teaching, yes, ONE COURSE a semester, to distract me from serious intellectual and creative toil? I envisioned leisurely hours out at the peaceful Prindle Institute where I would scribble/type away on philosophical articles, children's literature articles, children's books, and my brilliant memoir. Instead, every hour seems to be filled with the intense activities of this extraordinarily alive academic community. I am in five reading groups (one of which I'm leading). The Prindle Institute for Ethics alone has several events every week (there are even two competing events tonight). So far this week, I've attended a screening of the documentary Dark Days, about a community of the homeless living under the Amtrak tracks in New York City, a talk given by a Fulbright scholar who founded an NGO in El Salvador, and the meeting for my reading group on the ethics of life writing; tonight is a poetry reading by a Salvadoran poet; tomorrow is a talk on "Demystifying Cuba" as well as a reading group on Bound by Recognition by Patchen Markell. I'm getting involved as a speaker and writer-in-residence at Greencastle's three elementary schools. Bill Clinton is speaking on campus on Friday. I have tickets for La Boheme at Indiana University in Bloomington on Saturday. The theater department is staging Hedda Gabler this weekend, too. All I do is have fun! And part of my job just IS to have fun. Part of what is required for there to be a thriving academic community is for faculty to support events by their attendance. Outreach to the community is part of my job, too. Can I help it if so many of my professional duties happen to be pleasurable? But still. I can't sustain this pace indefinitely. Sooner or later I need to focus my thoughts on my next book, or on a major article, or something I can write down on my monthly list of accomplishments. Right now, my main accomplishment for November is "I had fun." I did write one important book review and one short article; I did give a talk at Arts Fest here on campus and organize another Arts Fest event; and I did conclude my ethics-of-life writing reading group. And I taught my Rousseau class. But I mainly had fun. And that is good for a while. It's hard to argue with the claim that fun is good. So I'll have fun for a little while longer. But then I'm going to buckle down. 1) The kind and helpful concierge at the Palmer House Hotel, who really did seem to care about every detail of the happy days we were planning - "Come back and tell me how it went!" 3) A pilgrimage to Hull House to pay homage to the community of brilliant, creative, politically engaged women mobilized by Jane Addams to improve the lives of Chicago's immigrant poor - incredibly moving and inspirational. 4) Drinks at the Signature Lounge on the 96th floor of the John Hancock Tower with sweeping views of Lake Michigan at sunset. 5) A theater production of a play about the Great Chicago Fire, performed by the Looking Glass Theater Company, which has its stage right in the old pumping station that was one of the only two public structures to survive the Great Chicago Fire. 6) The Tiffany dome at the Chicago Cultural Center, once the public library, and so filled with quotes about the importance of books and reading in many languages from luminaries through the centuries. 7) Millennium Park in the Saturday sunshine, where we joined the throngs of tourists taking the mandatory photo in the reflective surfaces of "the Bean." 8) Hours and hours at the Chicago Art Institute, especially the miniature Thorne Rooms with their incredible detail - I joined and now have a two-year membership, which I hope will motivate me to take many trips back! 9) Hours and hours and hours and hours talking with Robin! Now I'm home, happy to be back in my sweet little Greencastle, even as I can close my eyes and see CHICAGO. After I teach my Rousseau class tomorrow, I'm off for a long weekend in Chicago, visiting with my beloved friend Robin, a friend since my days of working at the University of Maryland almost thirty years ago. She's flying in from Maryland, and I'm driving to Indianapolis and taking the bus from there to Chicago (three hours and fifteen minutes each way), because I decided that a little Greencastle mouse wasn't going to be able to handle driving in such a great big city, a city "so proud to be alive and coarse and strong and cunning." Robin and I haven't made any plans yet except that we're staying in the grand old Palmer House Hotel. And we want to go to the Art Institute. And maybe do an architecture tour of some kind. And talk and talk and talk. I think maybe I'd also like to eat a cupcake. I read once in an inflight magazine that Chicago is known for its cupcakes. That's it. We can figure out the rest as we go. For now, it's just teach (Emile, Book Three), and then get in the car and start driving, and get on the bus and start riding, and meet up with Robin and start hugging and talking. And find a cupcake and start eating it. "Taking Emotion out of the Equation"
Hmmm. This is definitely something to think about. Brenda's advice made me remember my college days. I was an undergraduate at a women's college, Wellesley, and we ALL ate out of emotion ALL the time. Sometimes there would be ice cream for dessert at dinner, and you never saw such a frenzy. First there would be screams and shrieks of uncontrolled delight. Then there would be a mad rush over to the ice cream table, with lots of pushing and shoving. We would grab enormous soup bowls and cram them full of multiple scoops of ice cream and eat the whole entire bowl before eating anything else. This, although there was plenty for everybody and actually ice cream night was quite a frequent occurrence. Then I went to Princeton for grad school, living in the Graduate College. Princeton at that time was almost all men. We had our first ice cream night at dinner. I screamed and shrieked and ran over to the ice cream table. Then I looked around. I was all alone. The men were just sitting there eating their dinner as if - as if there was plenty of ice cream for everyone and ice cream night was quite a frequent occurrence! So I have now spent two days eating the Brenda Ferber way. It isn't quite a fair test yet - is two days ever a fair test of anything? - because I had my strep episode on day one. But still I have to admit that the results so far are intriguing. I have a bag of my MOST favorite candy EVER, Hershey cherry cordial kisses, and I've been having two or three a couple of times during the day, fully savoring each one. Last night, at my Prindle reading group, I surveyed the snacks I had put out - fancy cheeses, crackers, Pepperidge Farm cookies, wine, lemonade, water - and I asked myself, "What do you really WANT to eat? Because you can eat anything at all that you want, you know." I decided that I wanted a couple of crackers with cheese, and two orange Milanos, and a small glass of wine, and a larger glass of water. And that was what I ate. I think I'm going to keep on trying this new plan, Miss Brenda! I'm never sick, so when I awoke yesterday with a terrible sore throat and lay freezing cold beneath a heap of blankets, unable to face any of the work-related tasks I had planned for the day, I wasn't sure quite what to make of my situation. If I wasn't sick, what could this be? Was I just MALINGERING? I love this word: "malingering." I love that there is a word that means "to pretend or exaggerate illness, esp to avoid work." I love that so many people are tempted to do this that a word was coined just to describe this particular strategy of work avoidance. I went to Kroger and bought a thermometer: a fairly disappointing one, I must say, as it promised to give me a result in 9 seconds and promised to have an actual alarm sound a warning if the temperature was over a certain point, and it did neither of these things. But it did say that my temperature was 101.4 That is not the temperature of a malingerer! I made a doctor's appointment for later in the day, but when I got there, the thermometer there said I had no fever at all. How could this be? I have to say I doubted their thermometer more than I doubted mine. But the kindly physician did accept my self-diagnosis of strep without even ordering a throat culture. I felt so ill as I waited in line to get my antibiotics prescription filled that I thought I might faint away upon the floor. It turns out that it was strep, or at least that within an hour of starting the antibiotics, all my symptoms were gone. I slept for 13 blissful hours and awoke ready to face a full and busy day of teaching, meetings, evening reading group. So I WAS sick, after all. Unless - would the symptoms have disappeared anyway, even without the medication? Could it be that all I needed was one day of . . . malingering? Here's the bad system that I've fallen into regarding my writing. I'll get an idea for a new book. I'll make some progress on this idea. Recently, I even got a contract for the idea. But then I'll turn against the idea. The idea seems so hopeless! So bad! So flawed from the get-go! Sometimes I have some smidgen of justification for turning against the idea: a passing expression of doubt on the part of an editor, an evening of tougher-than-usual critique from my writing group (no, from ONE PERSON in my writing group). I decide that I can't write this book. As my friend Ina says, "Just because you've begun a mistake, you're under no obligation to continue on in it." In the case of the recent book under contract, I even entertained the idea of canceling the contract and returning the advance. In the case of recent gropings toward a book series, I just put the idea away in my forget-about-it file. But this is not a good system, at least for me. It really isn't. Here is what a good system would be. For the book under contract, I ended up doing this, and by page 50 I was in love with the book, and by page 150 I thought it might possibly be the best book I'd ever written. So now for this new possible series idea, this morning I took it out of the forget-about-it file and read over what I have so far and discovered that it is not in fact bad. It is in fact good! Not great. But good. Flawed. But not irredeemably flawed. And in any case, guess what, I don't have any other ideas right now that are any better. And I'm miserable when I'm not writing ("The Dread"). So I might as well write this as write nothing. And here's my prediction: I bet I'm going to be very glad that I did. So for now I'm just going to keep on truckin'. My sister, Cheryl, is here visiting me in Indiana. Hooray! Cheryl just started working as a tax specialist for a pharmaceutical company in New Jersey that is a subsidiary of Eli Lilly, which happens to be the largest employer in the state of Indiana, so she is out here for a series of business meetings at the huge Eli Lilly campus in Indianapolis. But first we are playing together in Greencastle, which itself happens to boast the site of Eli Lilly's first little homely drugstore, situated on our courthouse square, where the little eatery Treasures on the Square is now located. Cheryl always throws herself with enormous enthusiasm into any new endeavor, so she was eager to make a pilgrimage to this historic spot. 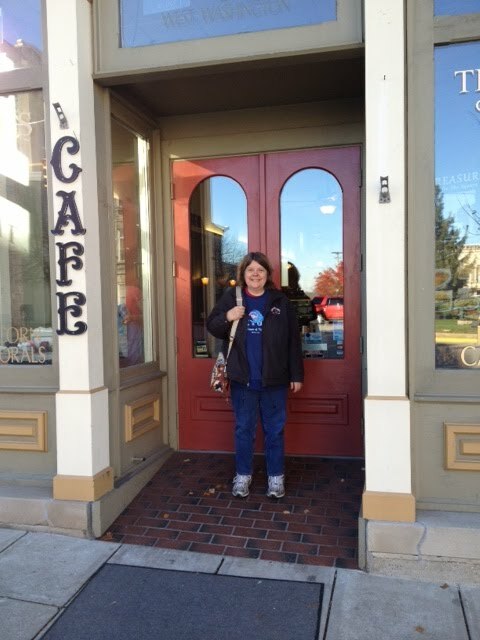 So we had breakfast at Treasures on the Square as soon as she arrived yesterday, and then I took her picture in front of its charming front door. The rest of the day was filled with happy sightseeing, including a drive around the backroads of Parke County where we saw EIGHT covered bridges, my biggest haul yet! 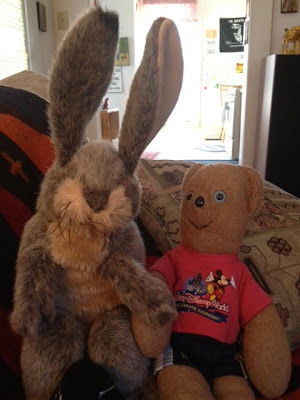 Her stuffed bear Taddy has made friends with my stuffed rabbit Ruby, and it's altogether a wonderful visit. There is nothing like having a sister! Once when one of my boys was in high school, he had a disappointing grade on a history exam, so I brought this up for discussion with his teacher during parent-teacher conferences. "Do you have any suggestions for what he should do to prepare for the next exam?" I asked. "He should do something else!" she said. "Something else?" I asked timidly. "Yes, something else! Because whatever he's doing now isn't working!" At the time I considered this to be exceptionally unhelpful advice from an uncooperative teacher. But I have to say that I've warmed to this advice as the years have gone on. Take my weight for example, the creeping chubbiness on which I've posted before, and which, alas, has only gotten steadily worse since that post. What should I do about it? Well, SOMETHING ELSE! Because what I'm doing now - that is to say, eating every morsel of free food provided by DePauw University in general and the Prindle Institute in particular, supplemented by comforting feasts at the Blue Door Cafe, plus occasional lovely dinners, with free-flowing wine, at friends' houses - isn't working. There is something about the clarity of this insight that is more helpful than I previously realized. Maybe I'll try something else, try NOT doing what I've been doing, and see what happens. It just might work, after all. Yesterday contained one of the biggest treats of the semester for me: a class trip for my Rousseau course. We headed off to the Green Performing Arts Center across campus for a program focused on Rousseau's opera, Le Devin du Village (The Village Soothsayer). Yes, Jean-Jacques Rousseau, famous political philosopher (The Discourse on the Origin of Inequality, The Social Contract) and educational theorist (Emile), who also happened to write the best-selling novel of the eighteenth century (Julie, or the New Heloise), was also a composer of some renown in his own time, who wrote not only the libretto but the score for an opera that was the toast of Paris upon its production in 1752. The king reportedly went around the palace singing the opening aria, "J'ai perdu mon serviteur," all day after the performance "in the vilest voice in the nation" and offered Rousseau a lifelong pension for its creation (an offer that Rousseau refused). Yesterday my students and I, as well as other interested DePauw community members, had our opera extravaganza in the Thompson Recital Hall at the Green Center for the Performing Arts. I made some introductory remarks on Rousseau-as-musician; Misti Shaw of the Music Library presented a fascinating in-depth look at the war between French and Italian opera during the time period (Rousseau took the side of the Italians and was burned in effigy by the Paris Opera); Prof. Matthew Balensuela discussed Rousseau's influence on child prodigy Mozart, who wrote his own treatment of the opera (at age twelve, mind you!). And, biggest treat of all, Prof. Caroline Smith's voice students performed three of the arias for us, including the one that so pleased the king. I think my students enjoyed it as much as I did. Who doesn't love a class trip? Thank you, colleagues and performers, for making this amazing outing possible. I had a little setback yesterday, on day one of my new life. I did have a lovely French toast and hot chocolate breakfast at the Blue Door Cafe, with just ONE piece of French toast because of the new slimming plan, and I did have a lovely walk up and down Seminary Street, as part of the same weight-loss project. But I just found myself consumed with a restless agitation, the vague feeling that despite all my brave new resolves my life was spinning out of control, with lots of pending decisions that need to be made and might be made wrongly, though as for that, whatever I decide isn't going to matter all that much either way for the rest of my life. But still. I bumped into my friend Deepa as I was heading out to find some slimming food to eat for lunch, and told her what I was feeling, and she said, "Oh, I feel that sometimes, too. I call it 'the Dread.'" I felt so much better once it was named, pinned down with a label. Oh, it's just the Dread. People are bound sometimes to be shadowed by the Dread. Life has so much flux and uncertainty in it, so much doubt about what to do next, and how to do it and why. Of course, this is going to lead to the Dread! So now my November new life has to have some provisions for getting past the Dread. As I learned in a wonderful talk some years ago by writer Laura Deal, "activity is the antidote to anxiety." So I got up early and walked up to the Prindle. I'm going to write the book review on the stunning collaborative effort, Keywords for Children's Literature, edited by Philip Nel and Lissa Paul, which I've been assigned to do for the Children's Literature Association Quarterly. I may take a mid-day walk around the quarry rim - more slimming! And as the biggest source of the Dread in my life right now is not having a new book project that I feel good about, I'm going to take my little notebook and sit for a peaceful hour in the Bartlett Reflection Center, right next to the Prindle Institute, and just THINK. Dread, begone! Claudia's new life is here!